"If you'd like a glimpse of the future of symphonic music — or if you just want to know what devilish majesty the New York Philharmonic will shortly unleash — this two-year-old YouTube video from the Proms in London is a good place to start. It shows the world premiere of Thomas Adès's Totentanz (Dance of Death), which the Philharmonic will perform March 12 through 14," wrote Justin Davidson in New York Magazine. The critical buzz anticipating these performances, conducted by Adès himself, extends to The New Yorker's Alex Ross, who wrote that Adès is "securely established as a modern master, each new piece assuming the trappings of an event." In The New York Times, William Robin wrote a piece titled "They're Always Stealing His Stuff" about Adès's huge influence on younger and middle-aged composers such as Andrew Norman and Caroline Shaw. He wrote, "Based on a grim 15th-century frieze, Totentanz is far from the uproarious polystylism of Asyla, though it shares its balance of the lyrical and the unsettling." To portray such a variety of characters, Mr. Adès employed a wide range of nontraditional instruments, such as a standard referee’s whistle with which Death controls the proceedings. “When he blows his whistle, you have to stop what you’re doing,” said Mr. Adès. "Sibelius has had a kind of renaissance, and he's really accepted now," said Mr. Gilbert. "I think it's Nielsen's turn." That's a quote from today's Wall Street Journal piece by Corinne Ramey on Alan Gilbert and the New York Philharmonic's Nielsen Project, the multiyear exploration of the Danish composer Carl Nielsen. 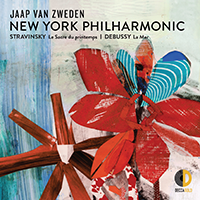 The project is notable not only because the Philharmonic has put considerable institutional weight behind promoting a lesser-known composer, but because, at a time when orchestras are often thought to be increasingly stylistically similar, these recordings illustrate a uniquely New York approach. The series' next installment, an all-Nielsen program that includes the fifth and sixth symphonies, begins this Wednesday. Read the whole article, which talks about how Gilbert got into Nielsen, and how he and the Philharmonic approach his music. Click here for more on the latest Nielsen recording. And join us Wednesday through Friday!